Since I last wrote, Jack the shire has come along well. Helen leads him in with no stickiness from the field. 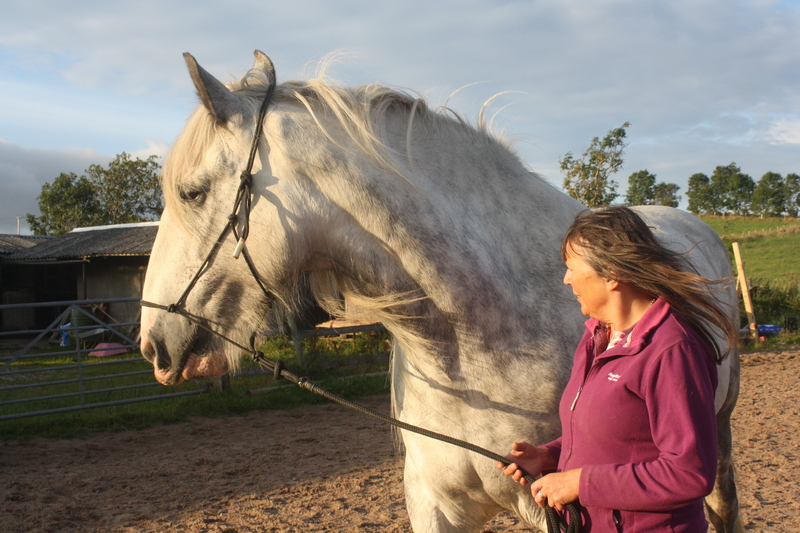 He is more respectful on the ground and light on the lead rope. We have ridden him out on shortish hacks and his confidence seems to have increased and he has not done any major ‘strikes’. Lots of positives! 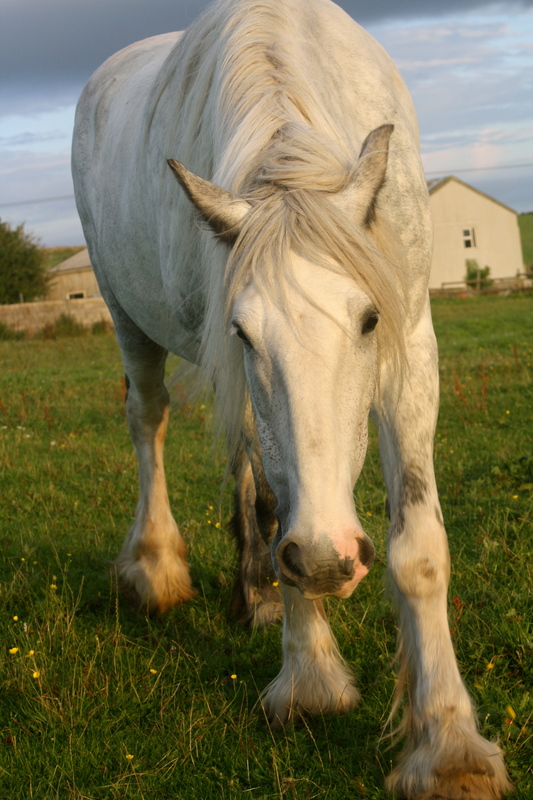 Helen recently moved Jack and 4 other horses to their new home in Northern Scotland. It was a sad day for me to wave them off…however, to see Jack walk onto the horse transporter, trusting us and being light and willing was proof in the pudding – the hours of patience and groundwork and slow, gradual baby steps forwards paid off. Helen and I were really proud of him. 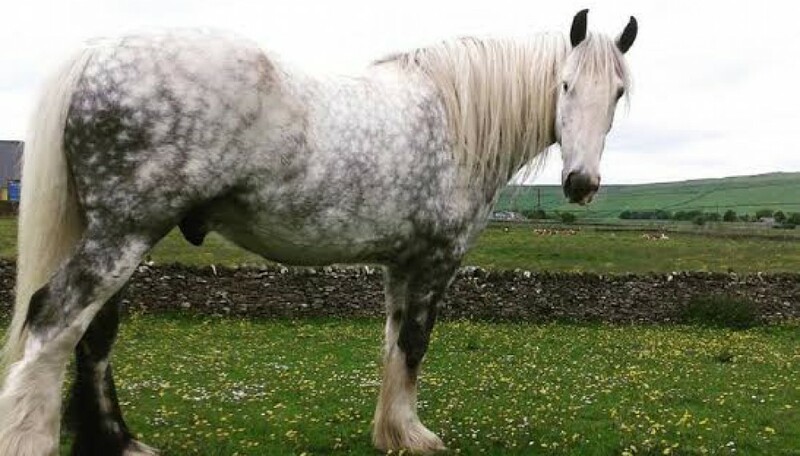 I know Helen will continue on with the natural horsemanship work we’ve done with Jack and I can’t wait to go and visit and hack around the loch with him. We hit a bump in the road with Jack late summer. We were walking out with him, me riding, Helen walking and he was so sticky we struggled to move him forwards. We were all really frustrated. So, it felt like we needed help. After a plea on a Shire owners forum, we found Dawn Cox who offered to come and work with us. Upon her suggestions, there are some changes we’re making. His feet are being trimmed more often, he’s getting a physio session to rule out physical discomfort…and we’ve been herding him while he has a rest from ridden work. He works at liberty. The idea is to move him as a herd mare would, dictating his direction and using a carrot stick to support his movement if our body language does not persuade him. The carrot stick is used as an arm extension not a whip. We make the arena smaller, so it’s a square pen, with 2 cones and we aim to steer him through them by the end of the session. It’s been 3 weeks and after a few sessions each week, he’s coming along. Helen leads him in from the field using a light touch, he is not barging out of the stable and he is moving more respectfully and lightly. We now await his new total contact saddle to add to the mix. Jack is going to be such an amazing horse to ride and be with! Mid summer moments of joy! Today I got to have my best 20 minutes of riding Jack the shire to date. We worked in the arena. He had energy! He felt huge and fitter than 12 months ago and he was light off the leg (except for a few sticky spots) and worked in energetic circles, did some great soft feels, backed up quite well, yielded over quite well and even offered a couple of canter strides. Only one tantrum (Lipizanner style), but it was amazing to feel how much horse I had and what he can do when he does move forwards. Helen and I have been mostly riding out and trying to get him fitter and moving forwards on the tracks and trails, usually herded by me and Bob the standardbred as jack still goes on strike at places where he either decides he’s had enough and would quite like to go home, or places where he feels unsure (and wants to go home). Although we have had some good wins along the way, it’s by no means perfect. Today felt like the patient work we are doing is paying off. He’s lighter, he’s more responsive, he’s fitter. It was a joy! We’ve had some great changes this last month with Jack! Through the winter we’ve done a lot of walking out with him, one on the ground to offer support when needed, one up top, to build his confidence out on the local country roads. This finally seems to have paid off. Helen got him out by himself for a short distance which was great, as in the past, it’s taken a lot of leg to get him up the hill and out of the top gate onto the road. He was more willing and less bothered. Since then, we’ve teamed Helen up on Jack with me on Bob and we’ve hacked out together successfully for short rides. Jack seems to have figured out that support can come from his rider (something that I’d chatted to Buck about a the clinic), not just a ground person. He had a little wobble on the ride and I was able to ‘pony’ him using Bob, who is good at coming alongside and encouraging Jack along. So, we may just have a combination that works for some longer spring and summer rides. We could do with helping Jack get less wide for Helen’s hips to be happier! A few steps of lightness in trot on a soft feel. Heaven! he feels so buoyant and powerful yet light as a feather! making it out of the gate and to the top of the hill without needing support from Helen on the ground with a lead rope. It took a lot of leg and some serious serpentining, but we got there (just!). keeping his feet moving and anticipating the Shire strikes where he just plants his feet and won’t move. Ok, I know the to do list is longer than the success list, but, hey, it’s winter, it’s wet, it’s grim weather-wise and we are getting out as much as we can when life doesn’t get in the way! Going back to the Buck DVD’s and writing some lesson plans to work on. It’s been a few steps forwards with Jack over the last week. Helen and I are feeling encouraged. We’ve been working on a) getting to the feet so the shire strikes are more fleeting if they happen- any foot will do- but we need to get one moving if he gets stuck. This may even involve hopping down to lead him forward or having a ground person hook on a lead rein and move him on. The strikes are therefore shorter and less satisfying for Jack and less frustrating for us, and it keeps the energy moving forwards a bit more easily. It feels kinder to as sometimes, once a lead rein is hooked up, he just shifts out of his stuck place, so less need for lots of mini serpentines, increasingly more pointed leg aids etc…we’ll ask nicely, more firmly and perhaps one more time with the leg aid then shift gears. This has been successful. We also tried getting him to head out of the gate up the field at a different angle and at a trot yesterday and this again got his energy moving more and he was less hesitant about leaving the farm. Other achievements- standing still for mounting at a gate or wall is on our list and Jack had regressed from his previously fantastic standing for mounting at the mounting block ( he is 18.2hh remember!). He started moving sideways or backwards once lined up…so we’ve been getting him set up and using cones to create an area for him to stand in and settle. we’ll hope to translate this to the gate so he’ll stand if we need to dismount/remount/change rider on a hack out. Finally, we got out for a ride yesterday..a few strikes so mostly hand walked out for a mile or two (Helen was riding Barney, her older gelding), after some shenanigans, I managed to hop on from a wall and had the most willing light shire on the way home who would happily soft feel and even had a beautiful collected trot, with forward energy and lightness. Heaven! Today in the arena we wanted to focus on energy and transitions, aiming for lightness off the leg moving forwards, then halting backing soft feeling then moving off the leg again. He stood in a puddle too…so, all in all, it feels like we are moving along again after a few regressions recently….but we all have our moments.